A blockchain is a list of all of the transactions that are programmed into the record. Any kind of economic transactions, not just financial ones can be part of a blockchain. Therefore, a blockchain can be thought of as a sort of digital ledger. You could also think of a blockchain as being a huge public ledger that anyone can check and see different transactions. This public ledger would also be protected from tampering. And many people consider blockchains to have a significant overall impact, especially on search marketing. Blockchain enables bitcoin to function. The public transactions of cryptocurrencies allow people to see the general value of bitcoins and other cryptocurrencies, which will mean that it also gives bitcoins and other virtual currencies their value. The use of blockchains in virtual marketing space is then a disruptive force. Blockchains can potentially change a lot of things, including that of SEO and search marketing. 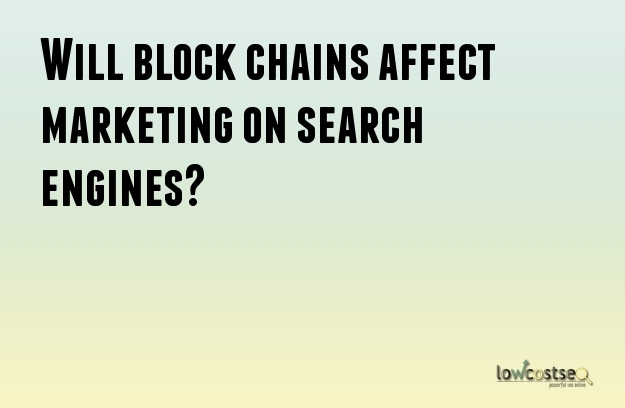 If you are developing some form of SEO tactic or if you want to market your business online, then you have got to be aware of how blockchains could potentially affect your marketing. It would be useful for you to know what blockchains could mean for SEO and search in general. How do blockchains affect search engine marketing? A blockchain can help verify that every person that clicks a website link is really a genuine user. This can help the website owner of the link know that they should only charge the particular advertiser for each genuine user who has checked out their site link. They would thus know only to pay that particular amount depending on how many genuine users really clicked the link in the first place. A website owner would then no longer need a middleman, in this case, Google, in order to arbitrate between the advertiser. Google's ad revenue network is under threat from blockchains. And since a blockchain is unhackable, it can also help with ad fraud as well. How do blockchains affect SEO? Companies will also need to start to integrate a blockchain as part of their website architecture. If you own or manage a website then you need to integrate blockchains within your own site. Web developers will also need to try and integrate blockchains as well. This is because you can get more organic website visits if you use blockchains as part of its structure. SEOs will need to work together with web developers in order to resolve all sorts of issues that may arise with the integration of blockchains. For example, there may be compatibility issues that only the web developer may be able to resolve. Therefore, SEO marketers and web developers need to work more closely together if they want to incorporate blockchains into the website. This will mean that for the website SEO needs to be considered as early as the web development stage. Blockchains are still a new development, so there is no telling what it could hold for the future. There may be more developments to blockchains that marketers need to watch.